Vientiane (VNA) – A photo exhibition on the legendary Ho Chi Minh Trail from 1961 to 1975 will be held in Laos to mark the 55 th anniversary of the Tay Truong Son (West Truong Son) road. 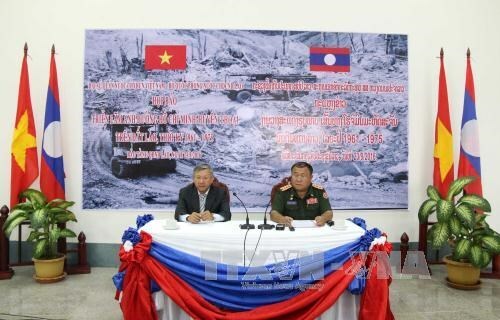 The Vietnamese Embassy in Laos and the Lao defence ministry announced at a press brief on September 23 that the 10-day event will open at the Lao Military History Museum in Vientiane on September 26. After the exhibition, all the photos will be presented to the museum. Addressing the event, Director of the Department of Propaganda and Training under the Lao Ministry of National Defence Saisamone Salapseng said the legendary Ho Chi Minh Trail is a symbol of the Vietnam – Laos fighting alliance, which played a significant role in the national liberation cause of the three Indochinese countries as well as the liberation and reunification of Vietnam. The exhibition, jointly organised by the Vietnamese Embassy of Vietnam in Laos and the host Ministry of National Defence, is the first of a series of activities to mark the 60th anniversary of the Tay Truong Son road in 2021. Vietnamese Ambassador to Laos Nguyen Manh Hung said that nearly 100 photos will be put on show, which vividly reflect the hardship and fierce struggle of soldiers and civilians of both Vietnam and Laos in building and protecting the road. The road is a monument to the great sacrifice and support the Lao people has provided for Vietnam in its cause of national liberation and defence, Hung reaffirmed.